Computer programming; Moral and ethical aspects. Who are computer hackers? What is free software? And what does the emergence of a community dedicated to the production of free and open source software--and to hacking as a technical, aesthetic, and moral project--reveal about the values of contemporary liberalism? Exploring the rise and political significance of the free and open source software (F/OSS) movement in the United States and Europe, Coding Freedom details the ethics behind hackers' devotion to F/OSS, the social codes that guide its production, and the political struggles through which hackers question the scope and direction of copyright and patent law. In telling the story of the F/OSS movement, the book unfolds a broader narrative involving computing, the politics of access, and intellectual property. E. Gabriella Coleman tracks the ways in which hackers collaborate and examines passionate manifestos, hacker humor, free software project governance, and festive hacker conferences. 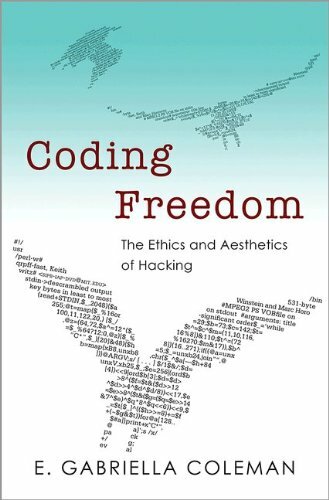 Looking at the ways that hackers sustain their productive freedom, Coleman shows that these activists, driven by a commitment to their work, reformulate key ideals including free speech, transparency, and meritocracy, and refuse restrictive intellectual protections. Coleman demonstrates how hacking, so often marginalized or misunderstood, sheds light on the continuing relevance of liberalism in online collaboration. About: Who are computer hackers?